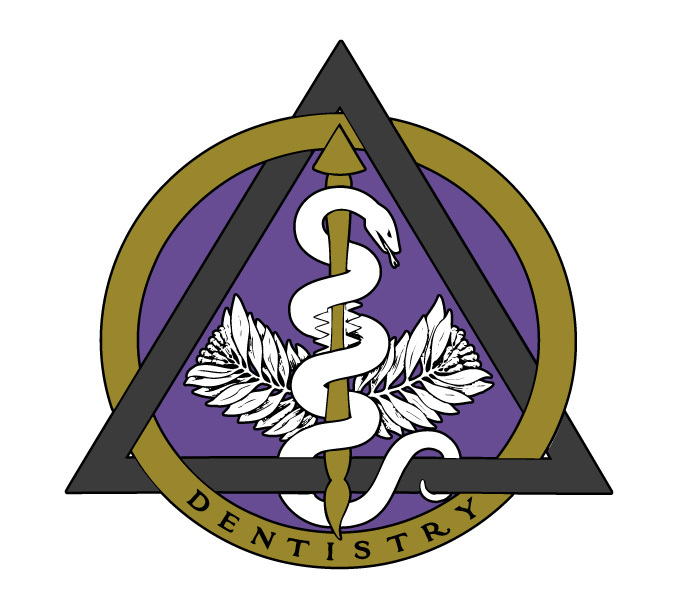 The official emblem of dentistry was adopted by the American Dental Association (ADA) in 1965. Its origin dates back to ancient times and to Asclepius, one of the earliest gods associated with health renowned for his healing abilities, humane treatments and remedies. He can be recognized by his staff entwined with a single snake. In ancient cultures the snake shedding its skin symbolized rejuvenation, healing and rebirth. The best known of his children include Hygieia, from whose name the word “hygiene” is derived and Panaceia from which the word “panacea” a cure-all or universal remedy originates. The ADA uses as its central figure a variation of the staff of Asclepius. In the background of the design are branches of 32 leaves and 20 berries, representing the number of permanent and primary teeth. The symbol is surrounded by an intersecting triangle and circle forming the periphery of the design. The Greek letter Δ (delta) represents the letter D in the word dentistry. The Greek letter Ο (omicron) represents “odont” meaning tooth. The design uses as its background color a shade of lilac which is the official color of dentistry. The color was chosen to trim dental schools’ graduation caps, gowns and dental emblems. For all your dental questions, you can always contact Dr Donan, dentist in Fresno. You can make an appointment here.